The classic line-up with keyboard magician Rick Wakeman plus the brilliant new album �Going For The One� � so it was a must for us to see Yes in concert. Unfortunately they didn�t visit our hometown Hamburg, so we had to make the side-step to Bremen. We were four boys and a girl, all 18 or 19 years old. The Stadthalle in Bremen was filled with 8000 spectators. It was great to see all those people standing down there in the arena, while we decided to make ourselves comfortable on left stand seats. 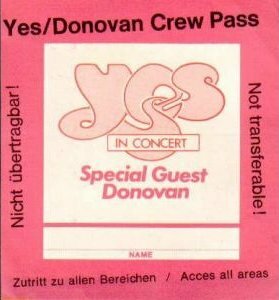 The show started with all lights out and a �ghost voice� announcing 60�s folk hero Donovan. The audience�s reaction was pure rejoice, but the enthusiasm shouldn�t last. The sound of the band didn�t fit with the singer�s fluttering vibrato voice, the guitarist seemed to believe he was Richie Blackmore (but he obviously wasn�t), Donovan�s new songs were weak, and his old classics like �Atlantis� or �Hurdy Gurdy Man� came quite indifferent and much too �heavy�. No fun! When Donovan announced the beautiful �Catch The Wind�, standing there alone with his acoustic giutar and a mouth organ, there was hope for a change, but the has-been star sang it in a dragging and agonising boring way. All of us were very disappointed. Break. When the lights were turned out again at 9.30, the audience went absolutely nuts. 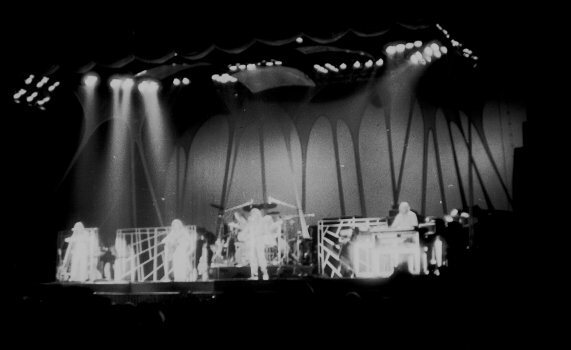 Classic music and gigantic, changing searchlights behind a still closed curtain, and then, at last: YES ON STAGE ! M.C. Jon Anderson appeared in a kind of red dress, Chris Squire wore a black / white �Backgammon� suit and white leather boots. What a sight. The band started with �Parallels� from �Going For The One� and went on with a great �I�ve Seen All Good People�, but to us the whole show seemed like a neverending climax. It was so stunning, that it�s difficult to describe, even now, 24 years on. Good old acquaintances like �Close To The Edge� or �And You And I� changed with the new songs from �Going For The One� in an intelligent cocktail. Visual things like films and fog were used economically in a quite expressional way. The musicians, in spite of all the tour stress, were in top form. Andersons voice soared in perfect lucidity above the instruments, all the same if the music was powerful or lyrical and gentle. The encores �Roundabout� and �Starship Trooper� drove the audience into complete madness, and Yes should have played on for hours, but unfortunately someone turned on the hall lights at 11:30. We entered Michaels orange beetle Volkswagen on this icy cold november night to search for a pub in the nice �Altstadt� of Bremen, but they all seemed to be closed. So we hurried home while listening to Genesis, Barclay James Harvest, Supertramp and Steely Dan, if my memory doesn�t fail. But even Genesis fan Michael had to admit, that he had witnessed an absolutely fantastic concert. Next day at school we were all a bit tired, but absolutely happy. And the memory remains. [???]. Here's a song called 'Wondrous Stories'. Here's is..uh a..a little song called. Something for..uh your entertainment. This is a song about travelling. Many long words. We've been travelling, travelling. For what seems a long time. Thousands, thousands, thousands of years we've been traveling. Yeah. We'd like to say one. We'd like to say one thing. Such a long time to come and see the show. It's good to be with you in Bremen. Well first we went to America. Getting down and having fun. Then off to Wembley England. Like the show had just begun. A little bit of Scotland. So now we're in Germany. And in the right place, at the right time. This is called the 'Bremen Boogie'.